This Japanese advert for car tyres has a deceptively slow start…although I wonder how effective it is at driving sales (excuse the pun)? The I or the E – is it really as simple as that? They are sometimes portrayed as polar opposites, one group preferring an evening with a good book, the other a night out at the pub. The introvert/extrovert categorisation, which is a feature of many personality assessments, is often described in simple binary terms. No introvert can enjoy social situations, extroverts never require a quiet moment. I’ve always known myself to be an introvert, but it’s not that I dislike other people or am antisocial, as some perceptions of ‘introversion’ imply. I love spending time with people; I could never live alone because more than about five hours without another person’s company is enough to get me searching my phone book for someone to call. When I have a problem, I never try and solve it alone, instead seeking the opinions of many people; my close friends will have experienced the repetitive soul searching. But there are aspects of the modern world which are bewildering for us introverts. The seeming impossibility of having a private life when so much as published online, the way in which digital communication demands immediate responses, are two examples. Although I love people, I do need time away from them, and when I need to concentrate on a difficult task, it’s not something I find I can always do in a group setting. It requires a combination of collaborative and solo working; everything in balance. So many aspects of culture demand that we become ever louder to get ahead, that blagging and selling is best, that it’s not really about the content, it’s all about the pitch. Which is something that I find incredibly difficult as someone who believes that authenticity and honesty are two pretty important traits for us human beings. When it comes to our working lives, Oliver James’ latest book Office Politics insists you have to join in and be loud or get left behind. And that’s why Quiet: The Power of Introverts in a World That Can’t Stop Talking by Susan Cain is a bit of a break which goes against much of the ‘wisdom’ that we all practice in our day to day work, and which, in most cases, privileges the extrovert manner of working. Group creative sessions – Cain covers studies which have shown that, far from being the key to creative success, people actually have more and better quality ideas when they collate their ideas separately. It means that those who are naturally louder don’t override the good opinions of quieter people, and that people don’t avoid contributing ideas they think might sound stupid. Open plan working and offices – the modern workplace is almost always open plan, separate offices being seen as out of date, hierarchical and obstructive to creativity and teamwork. Cain argues that smaller offices can actually improve concentration and productivity and that the endless drive towards getting everyone in rooms of tens if not hundreds of colleagues, might not be as productive as everyone thinks. That to be a good leader you must be an extrovert – Cain flips this on its head, proposing that quieter leaders are sometimes better at encouraging their team members to flourish and use their talents, rather than seeking the glory themselves. Whichever category you think you might fall into, it’s worth a look to see some of the understanding most of us take for granted, turned on its head. Adapting to demand or recreating stereotypes? Does Disney’s ‘rebranded’ Merida conform to the typical ‘princess’ imagery because that’s what the market wants, or has Disney got a bit worried about stepping too far away from the conservative strereotypes we’re used to from them? The popularity of the character pre-‘makeover’ (and the protest at her image change) answers the question! Today is White Ribbon Day, the UN’s International Day for the Elimination of Violence against Women, and men (and women who support the cause) can make a pledge to take action against violence towards women. Although the campaign focuses on women victims, it must be remembered that domestic violence is a hidden and dangerous problem and that both men and women can be victims as well as perpetrators. It affects millions of people in the UK each year and all victims should be offered the same level of support and help. Making a pledge is just one way of showing your support for bringing an end to domestic abuse. The White Ribbon UK website here outlines the ways in which you can do this. Of all the footage and images which have been broadcast since the terrifying weather on the US East Coast began, it’s the photos of central Manhattan like this of Times Square which seem the most unnerving. It’s a place which is designed to be filled with people. There’s something so strange about the hundreds of advertising boards brightly lit but with no one there to see them. And it makes the adverts themselves seem all the more empty when many thousands of people nearby have lost power to their homes, or worse. It was my birthday almost a month ago and, as ever, most of my lovely presents were books. Amidst the collection, though, there is one which has remained unopened. It’s not because I object to it (which is not a rarity), or because I’ve read it before. It’s because I’ve been quite daunted about making a start with it. In an inspired moment, my brother gave me a book about building your first website and I’m embarrassed to admit I’m a bit scared of it. I want to get to grips with this stuff but it feels like such a huge area of knowledge which I need to catch up on! But today I’ve got home from work feeling inspired to make a start with it. I’ve even got some ideas of what I’m going to ‘build’ (after many many false starts, I imagine). So, what have I got to lose? Be honest, which household gadget could you live without? Would there be any impact upon your day to day life if you had no laptop? What about your phone or your vacuum cleaner? When my two friends and I were choosing a flat to live in just after university, having a washing machine wasn’t one of the priorities. ‘The launderette’s just round the corner,’ we reasoned, when weeks later we were hand washing most of our clothes in the bathroom sink. The lady who ran the launderette was rather strict and we were a bit scared of her; she advised us on drying times for different clothing types and that was all a bit much. ‘Hand washing saves money and water, too,’ we admirably reasoned. Whatever their gadget of choice, I’m fairly sure that most people I know would rather lose quite a few household mod cons than lose their internet connection. To work, communicate, find out information and keep ourselves entertained most of us rely on the internet on a daily basis. Even the Lords are talking about its importance. A communications committee has raised concerns that the government’s obsession with rolling out speedy broadband overlooks those parts of the country which have little or no coverage at all. 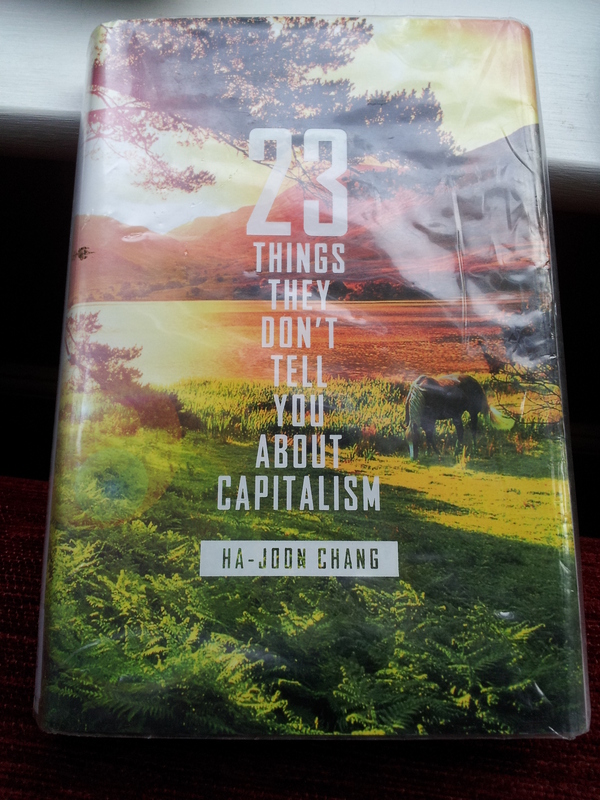 Well, if you ask Ha-Joon Chang, the author of 23 Things They Don’t Tell You About Capitalism, those people in remote parts of Cumbria who each evening struggle to stream yesterday’s episode of Eastenders in a valiant attempt to keep in touch with what’s happening in the outside world don’t have it that bad after all. I’m reading Chang’s book at the moment and really like the way that he challenges aspects of free-market capitalism which we don’t really question that much. I don’t always agree with him, but it’s refreshing to read a viewpoint which strays from the norm. One of his chapters is: ‘The washing machine has changed the world more than the internet has’. He argues, first of all, that the development of internet-based communications hasn’t had as much impact on humankind as the invention of the telegram did. Chang uses the example of sending a 300 word message across the Atlantic. Sending a fax would take 10 seconds and an email two seconds. The invention of the telegraph, on the other hand, reduced the travel time of a message from the steamship’s best attempt, two weeks, to just eight minutes. More interesting though, and linking to my (brilliant) anecdote about washing machines, is the social change which Chang attributes to the invention of the washing machine. The time saved thanks to washing machines, according to Chang, has transformed the way that women live by enabling them to enter the labour market (as opposed to washing and ironing clothes by hand and the other lengthy domestic chores due to the lack of electrical appliances). It also meant that those women who were working were increasingly employed in non-domestic roles. Leaving to one side the, ahem, blissful and limited family unit drawn here, and the fairly patronising overtones about the ‘status’ of women, is Chang making a valid point? I do like this challenge to the presumed idea that the internet is the greatest progression that society has ever made. But I’m slightly bristling at the argument which places the realm of washing clothes so firmly with women, and that simplifies complex interpersonal processes such as divorce or workplace equality into such a linear process. On an individual (and possibly selfish) level I’d rather be able to stream a documentary whilst emailing a friend than dry and iron my clothes in super-quick time. But, do we owe more to other technological inventions than we think? No doubt, inventions such as the washing machine changed the way we all live. But, is there more to come from the telecommunications revolution in the future? And what about the social change which the internet has already brought about? It would be naive to assume that those long-despised invisible barriers which push some to society’s top and others to its bottom have been broken. But for some reason the issue has come to a head this week in three different areas. The BBC took a less touchy-feely approach in its publication of new research on women in the workplace. The stats on the proportion of women in top jobs are grim and the BBC did nothing to soften them with its winning headline: ‘Are women their own worst enemy when it comes to the top jobs?’. The report was perplexingly uncomplex for my liking; I’m not sure how many people have overcome their own ‘unconscious bias’ by being told to be more confident. Certainly it’s an essential ongoing debate, but some of the more constructive pointers, for example from Cherie Blair, were sidelined by the overbearing headline in my opinion. Last of all, this week Plan B’s film Ill Manors premiered. It seemed canny that the film, focusing on social unrest and the dark side of east London’s society, was released so close to Milburn’s report Plan B has not admitted to any personal hopes of social change as a result of the film in some interviews. The three approaches, one from politics, one from broadcasting and another from film, raise more questions than they answer. Perhaps the most important thing they remind us of is the depressing inequalities in the Britain of today. We need to talk about it, but we need to do something too. Are we being conned into thinking more about our daily moisturiser? I like to think of myself as a consumer who is fairly conscious of health and environmental issues. I am a recycling obsessive, I carefully consider what I eat and I avoid buying products which I know could be difficult to dispose of once I’ve finished using them, such as detergents and aerosols. But a recent trip to the US has reignited my ongoing concern with the chemicals in the beauty products which we use daily, and which seem largely to go undiscussed in the mainstream beauty media in the UK. Many US companies are now mentioning the absence of these ingredients, such as parabens, sodium laureth sulphate and others, as part of the marketing campaigns for their products. I first became concerned about this problem after watching (the arguably over-exposed but, I think, ethically sound) Sarah Beeny in her 2007 programme for Channel 4, How Toxic Are You? As a ‘celebrity’, she gained a mixed reaction from the press, who largely chastised her for what was perceived as unscientific naivety. She was worrying about the fact that the products we use on our bodies, including deodorants, moisturisers and shampoos, are not ‘natural’ when we are constantly surrounded by chemicals and artificial products. Some scientists have suggested that there could be links between the parabens (which act as preservatives) used in deodorants and breast cancer risk, as they may mimic the effects of oestrogen. However, scientists and charities, such as Breast Cancer Campaign in a letter responding to a Sun report on the topic, are quick to emphasise that these claims are not backed up with reliable evidence and cannot be used to proclaim the use of these products dangerous, since there are so many other sources of parabens within our environment. So, I am undecided really. Having spent quite some time scanning the ingredient lists of UK beauty products, there are definitely beauty brands in the UK which avoid some of these so-called dangerous chemicals. These include Good Things and some very high-end products like Avène and La Roche-Porsay. However, it does not seem to have reached the levels of the US market where television adverts mention the ingredients (or lack thereof); we seem to hear more about things being ‘Organic’ or ‘97% natural’, which could mean that the other 3% is bleach after all. I’m not a scientist and, as far as I can see, the jury is still out on whether these chemicals really do cause us harm directly. Is this just a case of ‘time will tell’, an approach which ought to cause concern when we consider that the PVCs in cling film, for example, were once thought harmless. I do have a sneaking suspicion that the US marketers are pandering to consumer concerns rather than addressing any scientific need, though. It’s no coincidence that the brands which use fewer of these chemicals seem to be more expensive. What do you think? Do you worry about the ingredients in your shampoo? Or do you feel more inclined to stick with a brand you’re familiar with and can afford, rather than lose sleep over whether there are risks?